SLC (single-level cell): Stores one bit per cell which makes them easy to read (it's either 0 or 1) and minimizes the write cycles they will undergo. SLC makes for the fastest, most durable NAND flash memory. MLC (multi-level cell): Two bits are stored per cell, making it harder to read but there's a cost advantage: you get twice as much storage space from the same amount of NAND. eMLC (enterprise multi-level cell): Multi-level cell NAND that is meant for enterprise environments and offers better performance and endurance than MLC but worse than SLC. 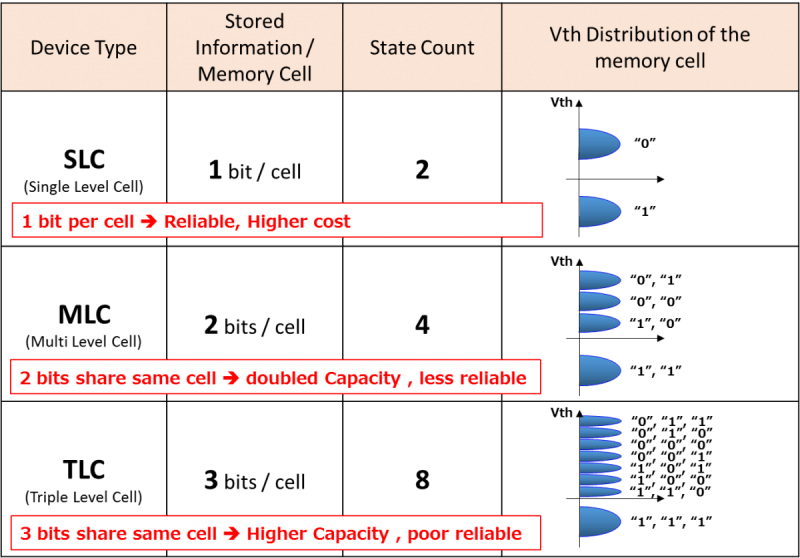 TLC (triple-level cell): Stores three bits per cell, increasing the complexity with the advantage being that you can store 50% more information vs MLC, further reducing costs.